The gay solider who human rights campaigner Peter Tatchell described as a “gay hero” and a “human rights defender” and the United States Government considers a traitor Pfc. Bradley Manning has been nominated for a 2013 Noble Peace Prize. Last week Manning pleaded guilty to 10 of the 22 charges brought against him related to the misuse of federal documents by releasing thousands of pages of classified and confidential information to the website Wikileaks. 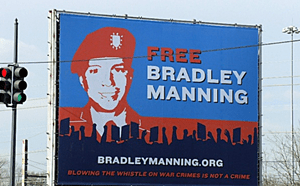 On nominating Manning, the entire parliamentary group of The Movement in the Icelandic Parliament, the Pirates of the EU; representatives from the Swedish Pirate Party, the former Secretary of State in Tunisia for Sport & Youth released a statement. TARGET Launches Line of Gay Pride T-Shirts – Seriously? Can it be so? You mean it is only the idiots in Washington who think Bradley is a criminal while the rest of the world knows something they don’t. Honesty matters.